How is it even possible to fall in love with a place? This was a first for me. This journey was like nothing I had experienced before. It was a gift placed in my lap, like when a new baby is placed on a new mother’s chest. It was instant love. Pure love. The only love I have ever felt like this was when I gave birth to my amazing two boys, Jacob and Ari. Israel is a place, a country I had only heard about, and then there I was sitting on an airplane preparing for my 10 hour flight with excitement running through my soul. “I am going to Israel,” I kept saying it over and over. I felt like a little kid, I can’t describe the excitement except to say, it was like “OMG, I won lottery!” Going to Israel for me was like I won the greatest gift of all, and there is no price tag I could ever put on this experience. From the moment I stepped off the plane, it was a magical journey. There was a certain warmth in my soul, a peaceful feeling like I never sensed before. I have traveled to London and Paris and a variety of nice resorts. I remember standing at Monet’s Garden in Paris and thinking how beautiful and peaceful it was, but there is not a place or an experience that will ever compare to my magical trip to Israel. I am writing about my experiences to try to capture my memories. It is undeniable that the love I have in my heart and soul for my home, Israel, will never fade. I always believed in God, but through this experience my belief has been deepened and strengthened. 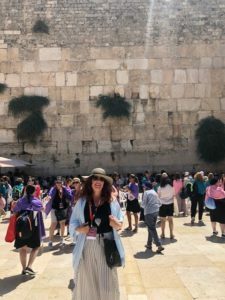 On the fourth day of our trip, we were meeting and preparing for our first visit to the Western Wall. My beautiful City Leader, Sarah, presented each member of my group with a Prayer book. She hand wrote a note to each of us. Then, we heard from an extraordinary speaker, Nili Couzens. Her job was to prepare us for our first visit to the Western Wall. She spoke about prayer and how it’s okay if you are not sure what to say when you are at the Wall. I listened to every word she said. I was in awe of her ability to take something so sacred and make us all feel totally and completely at ease. “God only gives messages for people who are looking for messages,” said Nili Couzens. I am always receiving messages from God. So, during my visit to the Wall I expected it to be the same. But, it was not my first visit to the wall, it was my second visit. My first visit to the Wall, I guess you can say I was in such awe of it, I froze. I was speechless. I could not remember what I wanted to pray about. I just kept saying, thank you, thank you, thank you. I walked smiling to myself, thinking I guess Nili was right, prayer is just a conversation and even if this particular conversation didn’t say much, I am pretty sure God got it. I was grateful for all I have in my life. During my second visit, I touched the Wall. I spoke silently to myself and prayed. Prayed for my children, for their happiness and fulfillment. I thanked God for everything in my life. I thanked God for my life. In the end, I didn’t want to leave the wall. I stood there and stood there, silently. Then, as I looked up I asked God for a sign that I am living the life he intended for me to live. I looked up and there it was, a heart shape in the Wall. That was my sign. I am all about love. Loving people. Loving myself. Teaching love. There it was, my sign. My relationship with God has always been my anchor in my life. God and I are close. We talk daily, and when I have been down, I mean really down, I pray and thank God for the day. I thank God for the lesson. Then, I will look up at the sky and say, okay, now you can give me a break! My relationship with myself will never be the same. It’s stronger. It’s better, probably the best it has ever been. 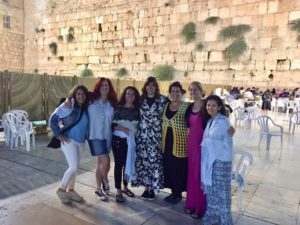 Visiting Israel, meeting my Israeli sisters, journeying through Israel with six new friends and being at the Wall, was and will always be pure love for me. I will keep this trip in my heart forever. My prayers now are that I can take what I have learned and pass it on to anyone whose heart is open to receive the same pure love. The more love we give, the more we receive. That is how the love we have for our children works. Pure love. The love of our self is exactly the same. The more we give, the more we have. I just needed to learn how to love me, now I can teach this to others to help you see that we are all made of pure love. Me and my new sisters! What an amazing spiritual trip with fabulous people. I too fell in love with Israel ??! Thank you to the JWRP for making this life changing experience possible. Lisa you are a true gem. May you continue to shine your inner light upon the world.